We’d like your help in letting the Oconee County Planning Commission know about our need for new libraries. We love libraries. You love libraries! So we need some new spaces to keep the fun going. One way we can do that is to make sure that we are a priority on the county’s 2020 Comprehensive Plan. Please print out and complete the questionnaire linked below. You can return it by mail to the planning commission at the address shown at the top of the page, or bring it by any library branch and we will return it for you. The Library generally follows the county’s inclement weather closings. If Oconee County government offices are closed for weather, the libraries will be also. Announcements about closings are made here on the website, and on the OCPL Facebook page. Library users who owe more than the $5.00 fine limit will now be able to use the Internet computers in all our branches. 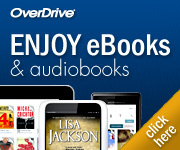 Users must still pay their fines down to checkout books or use OverDrive. 3-D printers, telescopes, and more. Oh, my! Did you know the OCPL now has a 3-D printer YOU can use? That’s right! The library now has a 3-D printer patrons can use to make their own creations. There are some restrictions and a cost involved. See the “Tech” link at the top of the homepage for more information about the 3-D printer, as well as telescopes that can be checked out by patrons and taken home! Drivers! New resource at OCPL.